UPSC Notification is out. 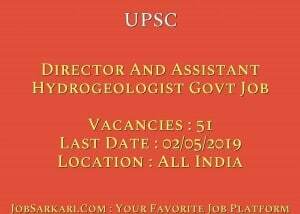 UPSC is recruiting for 51 Director And Assistant Hydrogeologist Govt Job Posts. You can check UPSC - Union Public Service Commission last date, download UPSC notification, visit UPSC official website and check other UPSC Vacancy details.Complete Vacancy and recruitment Details about 51 Director And Assistant Hydrogeologist Govt Job vacancies in UPSC are provided below by JobSarkari.Com only for you. Last Date of Apply Online. 02/05/2019 Up to 11:59 P.M.
Last Date of Complete Form. 03/05/2019 Up to 11:59 P.M.
SC/ ST/ PH/ Women. No Fee. Mode of Payment. Candidate Need to Pay Application Fee Through Net Banking, Debit And Credit Card or Through E Challan. Director. Candidate Must Have Passed Master's degree in Law with Specialization in the Field of International Law and/ or Internationals Relations or International Organisations And Having Specialization in International Law in M. Phil With 15 Years Experience in Related Field. 01. 00. 00. 00. 00. 01. Assistant Hydrogeologist. Candidate Must Have Passed Master of Science Degree in Geology or Applied Geology or Geo exploration or Earth Science and Resource Management or Hydrogeology or Master of Technology in Engineering Geology. 25. 12. 05. 05. 03. 50. Total Vacancy. 26. 12. 05. 05. 03. 51. 5. After That Candidate Have to Pay Their Application Fee. 6. Candidate Need to Take Print Out of Application Form For Future Reference. 7. Online Applications Can Be Submitted on or Before 02nd May 2019. Q. What is the Last Date For UPSC Director And Assistant Hydrogeologist Govt Job Vacancy ? A. 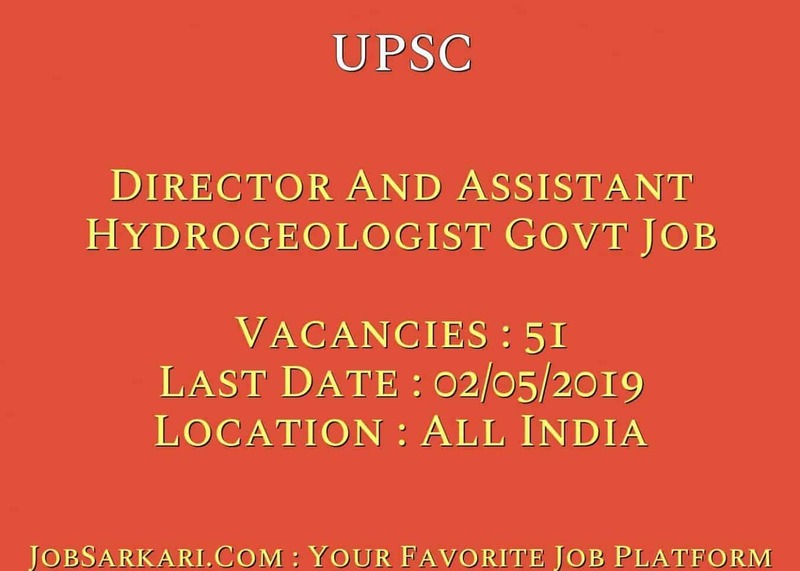 Last Date for UPSC Director And Assistant Hydrogeologist Govt Job Posts is 02/05/2019. Q. What is the Form Type of UPSC Director And Assistant Hydrogeologist Govt Job Recruitment ? A. The Form Type for UPSC Director And Assistant Hydrogeologist Govt Job Posts is Online. Q. How many vacancies are available in Union Public Service Commission Director And Assistant Hydrogeologist Govt Job Posts ? A. There are about 50 Vacancies in Union Public Service Commission Director And Assistant Hydrogeologist Govt Job Posts.